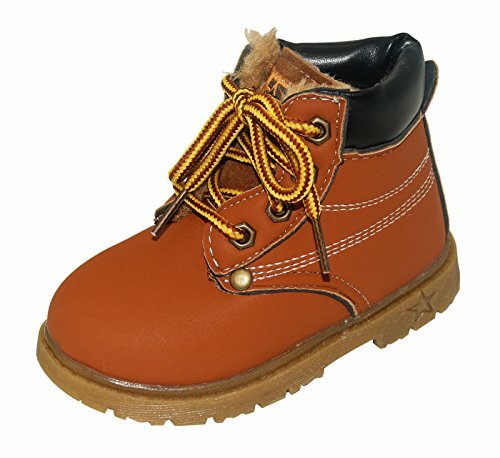 1.The upper of this kid's boot is crafted out of soft leather nubuck synthetic waterproof materials. 2.This boot has a lace closure with metal eyelets that ensures a comfortable fit for an easy on every time. 4.Support for the foot is guaranteed by the cushioning comfort insole. Flexible rubber lug outsole takes care of the traction control and ensures durability. 5.A lugged rubber sole gives them sure footing through any challenge. Fur lined keep your baby's feet warm and anticold. Material: Synthetic leather ; Sole: Tendon; Lining Description:Fur lined. Notice: The measurement may have 13cm (0.391.18inch) inaccurate errors. If you have any questions about this product by Happy Cherry, contact us by completing and submitting the form below. If you are looking for a specif part number, please include it with your message.